The Akkadian series Maqlû, “Burning,” is one of the most significant and interesting magical texts from the Ancient Near East. The incantations and accompanying rituals are directed against witches and witchcraft and ctually represent a single complex ceremony. 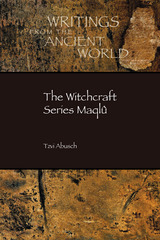 The ceremony was performed during a single night and into the following morning at the end of the month Abu (July/August), a time when spirits were thought to move back and forth between the netherworld and the world of the living. Introduction places the series in historical context and shows how it is a product of a complex literary and ceremonial development. Readers of the Hebrew Bible are interested readers, bringing their own perspectives to the text. 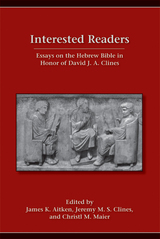 The essays in this volume, written by friends and colleagues who have drawn inspiration from and shown interest in the scholarship of David Clines, engage with his work through examining interpretations of the Hebrew Bible in areas of common exploration: literary/exegetical readings, ideological-critical readings, language and lexicography, and reception history. 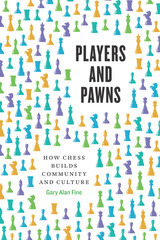 The contributors are James K. Aitken, Jacques Berlinerblau, Daniel Bodi, Roland Boer, Athalya Brenner, Mark G. Brett, Marc Zvi Brettler, Craig C. Broyles, Philip P. Chia, Jeremy M. S. Clines, Adrian H. W. Curtis, Katharine J. Dell, Susan E. Gillingham, Susanne Gillmayr-Bucher, Edward L. Greenstein, Mayer I. Gruber, Norman C. Habel, Alan J. Hauser, Jan Joosten, Paul J. Kissling, Barbara M. Leung Lai, Diana Lipton, Christl M. Maier, Heather A. McKay, Frank H. Polak, Jeremy Punt, Hugh S. Pyper, Deborah W. Rooke, Eep Talstra, Laurence A. Turner, Stuart Weeks, Gerald O. West, and Ian Young. James P. Allen provides a translation of the oldest corpus of ancient Egyptian religious texts from the six royal pyramids of the Fifth and Sixth Dynasties (ca. 2350–2150 BCE). Allen’s revisions take into account recent advances in the understanding of Egyptian grammar. The Pyramid Texts are the oldest body of extant literature from ancient Egypt. First carved on the walls of the burial chambers in the pyramids of kings and queens of the Old Kingdom, they provide the earliest comprehensive view of the way in which the ancient Egyptians understood the structure of the universe, the role of the gods, and the fate of human beings after death. Their importance lies in their antiquity and in their endurance throughout the entire intellectual history of ancient Egypt. 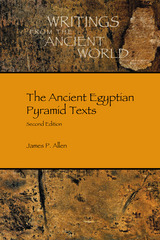 This volume contains the complete translation of the Pyramid Texts, including new texts recently discovered and published. It incorporates full restorations and readings indicated by post-Old Kingdom copies of the texts and is the first translation that presents the texts in the order in which they were meant to be read in each of the original sources. 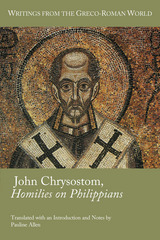 This volume offers a translation of sixteen homilies by the most famous preacher in Christian antiquity, John Chrysostom. These homilies on Paul’s letter to the Philippians constitute the most comprehensive ancient surviving commentary on the letter in any language. The homilies have a direct and conversational style in which examples from daily life abound: children, the elderly, food, agriculture, seafaring, money, commerce, building, furniture, weather, illness, good health, animals, and slavery. Friendship themes, based on Paul’s relationship with the church at Philippi, and Christology also figure largely in these homilies. This volume, with Greek text and English translation on facing pages, situates Chrysostom’s homilies on Paul’s letter to the Philippians in their historical, homiletical, rhetorical, and liturgical contexts. Since it began in 2002, the John, Jesus, and History Project has assessed critically the modern disparaging of John's historicity and has found this bias wanting. 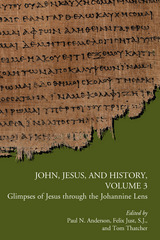 In this third volume, an international group of experts demonstrate over two dozen ways in which John contributes to an enhanced historical understanding of Jesus and his ministry. This volume does not simply argue for a more inclusive quest for Jesus—one that embraces John instead of programmatically excluding it. It shows that such a quest has already indeed begun. 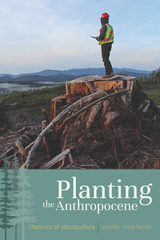 Contributors include Paul N. Anderson, Jo-Ann A. Brant, Peder Borgen, Gary M. Burge, Warren Carter, R. Alan Culpepper, James D. G. Dunn, Robert T. Fortna, Jörg Frey, Steven A. Graham, Colin J. Humphreys, Craig Keener, Andreas Köstenberger, Tim Ling, William Loader, Linda McKinnish Bridges, James S. McLaren, Annette Merz, Wendy E. S. North, Benjamin E. Reynolds, Udo Schnelle, Donald Senior, C.P., Tom Thatcher, Michael Theobald, Jan van der Watt, Robert Webb, Stephen Witetscheck, and Jean Zumstein. This groundbreaking volume draws together an international group of leading biblical scholars to consider one of the most controversial religious topics in the modern era: Is the Gospel of John—the most theological and distinctive among the four canonical Gospels—historical or not? If not, why does John alone among the Gospels claim eyewitness connections to Jesus? If so, why is so much of John’s material unique to John? Using various methodologies and addressing key historical issues in John, these essays advance the critical inquiry into Gospel historiography and John’s place within it, leading to an impressive consensus and convergences along the way. 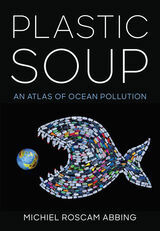 The contributors are Paul N. Anderson; Mark Appold; Richard Bauckham; Helen K. Bond; Richard A. Burridge; James H. Charlesworth; Jaime Clark-Soles; Mary Coloe; R. Alan Culpepper; Craig A. Evans; Sean Freyne; Jeffrey Paul Garcia; Brian D. Johnson; Peter J. Judge; Felix Just, S.J. ; Craig S. Keener; Edward W. Klink III; Craig R. Koester; Michael Labahn; Mark A. Matson; James F. McGrath; Susan Miller; Gail R. O’Day; Bas van Os; Tom Thatcher; Derek M. H. Tovey; Urban C. von Wahlde; and Ben Witherington III. 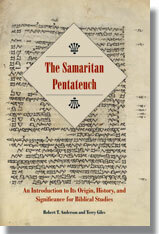 The Samaritan Pentateuch (SP) is the sacred scripture of the Samaritans, a tenacious religious community made famous by Jesus’ Good Samaritan story that persists to this day. Not so widely known is the impact of the SP outside the Samaritan community. Recently there has been a resurgence of interest in this scripture, as evidenced by several translations of the SP as well as reference in Qumran scroll studies to the SP or an SP-like tradition in an effort to describe some of the textual evidence present in the scrolls. This volume presents a general introduction to and overview of the SP, suitable for a course text and as a reference tool for the professional scholar. 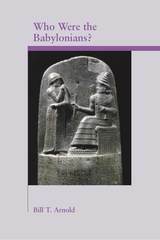 This engaging and informative introduction to the the Babylonians were important not only because of their many historical contacts with ancient Israel but because they and their predecessors, the Sumerians, established the philosophical and social infrastructure for most of Western Asia for nearly two millennia. Beginning and advanced students as well as biblical scholars and interested nonspecialists will read this introduction to the history and culture of the Babylonians with interest and profit. Building on a lifetime of research and writing, A. Graeme Auld examines passages in Samuel, Kings, Chronicles, and Isaiah that recount the same stories or contain similar vocabulary. He advances his argument that Samuel and Kings were organic developments from a deftly crafted, prophetically interpreted, shared narrative he calls the Book of Two Houses—a work focused on the house of David and the house of Yahweh in Jerusalem. 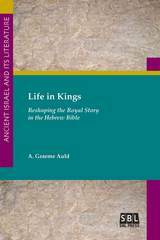 At the end of the study he reconstructs the synoptic material within Kings in Hebrew with an English translation. 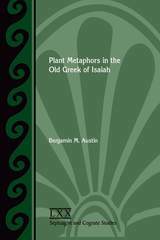 In this study Benjamin M. Austin analyzes all the plant metaphors in Isaiah and classifies them according to the metaphor translation techniques used by the Septuagint translator. Austin illustrates how the translator took the context of each metaphor into account and demonstrates how the natural features of the plants under discussion at times influenced their translation. 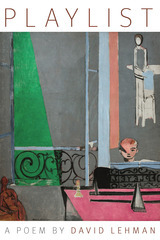 He argues that the translator tried to render metaphors vividly and with clarity, sometimes adjusting them to match the experience of his audience living in Egypt. Austin also examines metaphors in terms of their vehicles (the objects of comparison), so that the translation of similar metaphors can be compared. The burgeoning field of disability studies has recently emerged within the humanities and social sciences and, as a result, disability is no longer seen as the biological condition of an individual body but as a complex product of social, political, environmental, and biological discourses. The groundbreaking essays of This Abled Body engage biblical studies in conversation with the wider field of disability studies. They explore the use of the conceptual category “disability” in biblical and Near Eastern texts and examine how conceptions of disability become a means of narrating, interpreting, and organizing human life. Employing diverse approaches to biblical criticism, scholars explore methodological issues and specific texts related to physical and cognitive disabilities. Responses to the essays by established disability activists and academics working in the social sciences and humanities conclude the volume. The contributors are Martin Albl, Hector Avalos, Bruce C. Birch, Carole R. Fontaine, Thomas Hentrich, Nicole Kelley, Janet Lees, Sarah J. Melcher, David Mitchell, Jeremy Schipper, Sharon Snyder, Holly Joan Toensing, Neal H. Walls, and Kerry H. Wynn. In the past thirty years, the Mishnah has taken its place as a principal focus in the academic study of religion and of Judaism. Many university scholars have participated in the contemporary revolution in the description, analysis, and interpretation of the Mishnah. 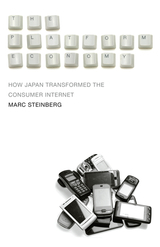 Nearly all the publishing scholars of the academy who are now at work are represented in this project. 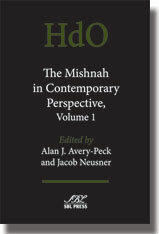 Both essential volumes present a broad selection of approaches to the study of the Mishnah. What they prove in diverse ways is that the Mishnah defines the critical focus of the study of Judaism. It is a document that rewards study in the academic humanities. This second volume of a two-part project on the Mishnah displays a broad selection of approaches to the study of the Mishnah in the contemporary academy. The work derives from Israel, North America, and Europe and shows the intellectual vitality of scholarship in all three centers of learning. What these articles show in diverse ways is that the Mishnah forms a critical focus of the study of Judaism. Zer Rimonim includes papers of interest to Professor Kasher in the areas of the Hebrew Bible and the ancient Near East and Jewish interpretations of the Hebrew Bible. 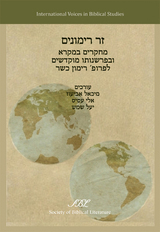 Contributors from a variety of Israeli universities include Yairah Amit, Elie Assis, Jonathan Ben-Dov, Joshua Berman, Gershon Brin, Hezi Cohen, Tmima Davidovitz, David Elgavish, Brachi Elitzur, Yitzhaq Feder, Joseph Fleishman, Gershon Galil, Tova Ganzel, Isaac Gottlieb, Edward L. Greenstein, Jonathan Grossman, Mayer Gruber, Jair Haas, Jonathan Jacobs, Bustenay Oded, Yosef Ofer, Jordan S. Penkower, Yosi Peretz, Frank Polak, Meira Poliak, Moshe Rachimi, Ayelet Seidler, Yael Shemesh, Shimon Shtober, Nili Shupak, Uriel Simon, Miriam Sklarz, Yechiel Tzeitkin, Shmuel Vargon, Eran Viezel, and Yair Zakovitch.